Ruger's New 77/357 - Could it be the Ultimate Survival Rifle? 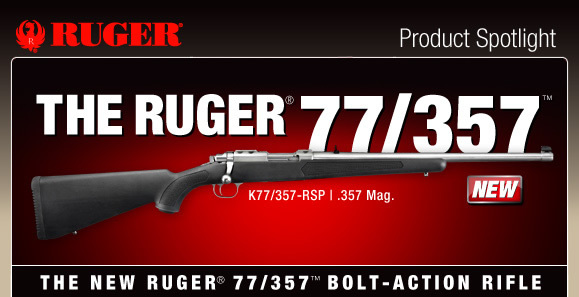 Ruger is proud to announce the Ruger® 77/357™, a lightweight, bolt-action rifle chambered in the venerable .357 Magnum and fed via a rotary magazine. The bolt-action 77/357 features a five-round rotary magazine and is offered in the Ruger All-Weather® configuration, which includes a durable, weather-resistant stainless steel barrel and receiver and a rugged, black composite stock. Although it is fitted with fully adjustable iron sights, the 77/357 also ships with patented Ruger scope rings, allowing a variety of sighting options for this lightweight (5-1/2 pounds), quick-handling rifle. 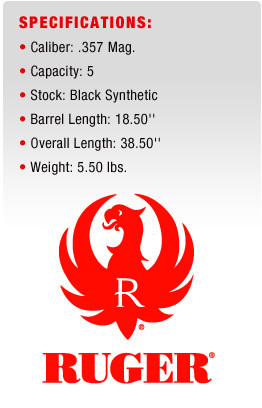 I will be getting my hands on the new Ruger 77/357 and will give a full review on all the features as well as how it stacks up as a survival rifle. Look for the review soon. Geez. I'm trying to decide which rifle will be my next, my newest & bestest "go to" rifle for tomorrow's TEOLAWKI rifle. So enter yet another choice, another "what if I didn't choose this one"... Enough already! Can I get two "go to's"?